This books begins a few years after the end of ‘Take back the Skies’, but with different characters in a different land. The main character, Aleks Vasin, is a young man who has left home to make his way in the world by joining the army. As you would expect, things go wrong and he deserts. He leaves the barracks with his horse and a Diary he found while searching for the money a Lieutenant had stolen from him. Instead of heading for home, knowing the army will go there and look for him and fearful of what his family will say, he heads north, via the tunnels that are being built throughout the land to improve communication and travel. He arrives in Syvana, the capital and searches for somewhere to stay and ends up in a family run bar/restaurant and makes a base there, working behind the bar and in the kitchen to pay his rent. While looking for work elsewhere, he turns up at the workshop of an eccentric inventor with a strange past. Alek’s natural ability with machines endears the boy to the man and he starts working for him, finishing off half-completed inventions and selling them for the old man. One day, the inventor shows him a skyship he’s built, one that can get through the storms that surround the islands of Tellus and keep them in an almost permanent grey…bit like Britain in the summer months. No one has journeyed beyond the clouds and returned, but that is what Aleks and the old man want to do. This is where it gets feisty. 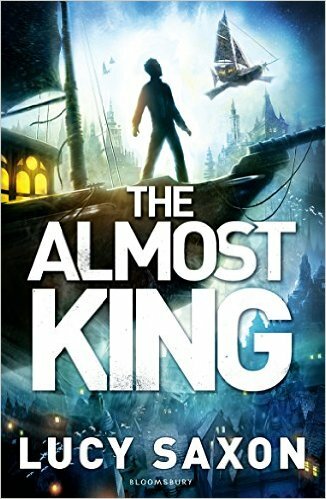 Over the remaining parts of the story, Aleks and his crew, not including the old man who feels he is too old to make the trip, meet strangers, face death and what they find beyond the storms leaves them almost speechless. The ending is superb with a satirical take on modern rulers and politics thrown in for good measure. As with ‘Take Back the Skies’, Saxon’s world building is excellent and the journey through the storms is a page turner. There are no wasted words, no purple prose and the characters she describes feel very real. The political situation between the islands, the characters of the rulers and the aftermath of the bitter war that had been fought several years before are all expanded on from the first book, but there is no need to read the previous one to know what’s going on. In short, this is a very good book and, although aimed at a YA audience, is a good book for adults too. 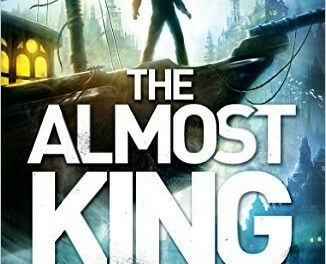 Finally, why is it called The Almost King? That is a plot point I am not going to tell you about.